Education abounds with myths, several of those ‘myths’ are about how the brain works. These myths have a long standing history of being perpetuated, believed, purchased, and shared. As educators we all have our own inquiries and hypotheses of how students learn best, sometimes we do this with a lack of educational research. This can perpetuate problems when there is no quality control of our inquiries and conclusions. I believe that the messages conveyed in this article need to be more widely promoted in our education systems, lest we allow our enthusiasm about the ‘issues’ to perpetuate further education myths. Neuro-myths are a particular problem in the 21st century because with new technologies we are taking a great deal of information and ideas surrounding education at face value. We are excited about opportunities for innovation and being able to extend student learning outside the 4 walls of the classroom. While this is wonderful, we still need to be careful that in the process we are not making damaging assumptions that will inevitably decreases the quality of education for our learners. The three urban legends discussed included Digital Natives, Learning Styles‘, and students as Self-Educators‘ with edtech. We make assumptions that technology has transformed our children into naturals at information processing, information retrieval, evaluation and critical thinking skills. There is an ever increasing shift from information processing models to integration of edtech itself into programming. However, the reality is that our enthusiasm about new technologies may in fact causing us to overestimate the educational impacts on our children. There are key differences between a child’s interactions with technology and what they are actually learning. We may assume that because children are quite adept at clicking on links and operating the tech, that they can learn the curriculum and knowledge skills much more efficiently than ever before. We may also assume that they can learn deeply on their own. What we also see is that students are multitasking more than ever with multiple media and technologies. The assumption is that because students are so adept at using technologies simultaneously, they also must be better at learning. However, research continues to show that our brains only allow for us to switch between different tasks NOT perform them simultaneously. 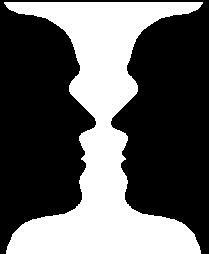 I have often thought of this as ‘Figure-Ground’, where we cannot ‘see’ both the figure and the ground separately and at the same time. Our brains cannot see both representations at the same time. Our brain must make the decision to move back and forth between the figure and the ground. However, believing that our students can do multiple tasks simultaneously is potentially damaging to our youth in terms of education and deep learning. The research has always shown, and still shows, that multitasking puts too much strain on our cognitive resources. The brain continually has to make decisions to switch back and forth between tasks, and this competes for cognitive resources. This absolutely impacts information processing abilities. Further, if we consider also that some students have difficulties with working memory capacity, and this further impacts the information processing functions. This has consequences if we do not consider that the uses of certain popular educational technologies are also detrimental to student learning. In fact, research tends to show that heavy multi-taskers are more likely to be affected by environmental stimuli – therefore they tend to perform worse in learning tasks! It is just not possible for learners to be heavy multi-taskers and learn as efficiently as possible. Students will indeed suffer if we perpetuate this myth that students they are excellent at multitasking. Myth 3. Students have specific Learning Styles. This is confusing, because it feels like common knowledge: we have all differentiated for our students to meet their learning preferences. And we SHOULD do that. This is different than the Learning Styles theory however. There is absolutely no scientific research that has ever shown that learning styles are useful to choose instructional methods. However, a great deal of money has been made from resources, workshops, and standardized tools to ‘help’ educators to take learning styles into account. The fact is that we do our students a disservice when we pigeonhole them into succinct learning ‘styles’. Preferred ways of learning are poor predictors of how students actually learn best. We can assess cognitive abilities, but need to stay away from preferred learning styles. It is impossible for educators to be able to completely take the myriad of dimensions into account to improve learning. But we also cannot use unfounded theory to decide. Educators always need to take into account the nature of the knowledge and skills that need to be taught, and the extent to which they are taught. Myth 4. Learners are Self-Educators in the 21st Century. Yet another myth stems from the excitement and enthusiasm surrounding the possibilities with modern technology in the 21st century: learners are also self-educators. So why would we still need teachers? This is an easy one to believe. With many exciting new opportunities, and excellent strategies that now exist to use technology, innovate, and engage students, all we need to do is give students a voice and help them engage in their own inquiries – from there, students should be able to figure it out, right? Nope. The truth is, there will never be a magic bullet that diminishes the power of good pedagogy. Students are not expert information problem solvers just because they search and use the internet every day. Research still shows that students NEED facilitators to guide the learning process. Further, information-processing, knowledge building and problem solving are very complex cognitive tasks. So complex, that they are major if not insurmountable for our students, or any of us, to do alone. Being savvy with electronic media does not make students effective ‘users’ of the technologies. Regardless of knowledge building tasks used, it is still of utmost importance that we teach our students to be information-literate, and learn transferrable skills, search and assessment strategies. How do we combat the learning myths? First, it never hurts to have a Feedback Friendly Classroom. This is an idea, that perpetuates the kind of pedagogy we need to help students become active participants in their learning. If you have read this far, you may be excellent at managing your own learning. However, students typically are not. We must always strive to figure out what works, what doesn’t work, and why. Further, we need quality control. We need research that is not flawed to help inform of us of our popular hypotheses myths and assumptions about education. I hope that you will be critical about where my information, and anyone else’s information is coming from. I am merely writing on my own professional blog. It is based on my references. It is not peer-reviewed. There are perhaps few quality control measures here – you will have to find out! – you can take my word for it, or you can cross-reference with your own research. Most likely, after reading this, your cognitive resources will likely move to another topic of interest – as it does with our students. We are, after all, only self-directed to a point. Regardless, I really hope that you will stop and think about any myths that may prevail in your learning environment. While we can make learning more innovative, engaging, relevant and appropriate for students, the learning process itself is complex with no easy answers. © Deborah McCallum and Big Ideas in Education, 2012-2017. Unauthorized use and/or duplication of this material without express and written permission from this blog’s author and/or owner is strictly prohibited. Excerpts and links may be used, provided that full and clear credit is given to Deborah McCallum and Big Ideas in Education with appropriate and specific direction to the original content.